Using stamps in speech therapy! I will admit it. I have a little problem with buying stamps. I really like them. There, I said it. My students LOVE using stamps in therapy. Of course I have a few who will sneak and stamp their hands in the process, but I don't mind. Here's my collection of stamps. I have them organized by seasons, letters, numbers, and who knows how long I have had Chuckie and Reptar? If you have stamps, you need stamp pads. Here's my collection. The ink in the cheaper seasonal stamps doesn't last very long at all, so these are my back up for those and for all my wooden stamps. I have noticed that the large stamp pads dry out pretty quick. I have a small water bottle and I just give the pad a spritz when it gets too dry. Works like a charm. Now, how do I use stamps besides using them for reinforcement? Well, look below. Below I am working with a group of three students who all have different speech sounds. I have them choose the stamp that they would like (making sure they are all different) and then stamp the back of their image or word cards. We then play a game where I mix up all the cards and they have to find their image and pull one of their cards. While we are playing the game, I use the stamps to mark the envelopes that I make so they can take their cards home. I take a sheet of notepad paper, fold it in half, staple the sides and then after the game I stuff their cards inside and tape the top with some cute washi tape. Yes, I have a washi tape obsession. I'll save that for another post! If you don't have the notepad stash (I should blush here), then just cut a sheet of paper that needs to be recycled into four sections and use that. I sometimes will use a brad to close the envelope instead of the washi tape. I also have used stamps for just about anything that you could use a paint dauber for. It's really fun to create scenes with them! It's always fun to see what the students can come up with if you give them a few stamps to create a scene. I hope I have given you a new tip that you can use with your stamp collection! Thanks for stopping by! Enter to win a Fujifilm camera! 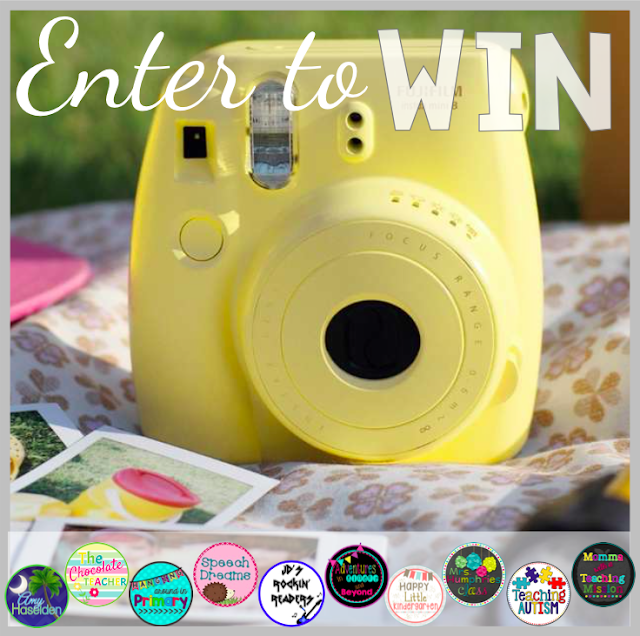 I have joined several TeacherpayTeachers friends to give away a super cute Fujifilm camera! All you have to do is follow us on Instagram! Enter the rafflecopter on the sidebar to the right for a chance to win this awesome giveaway! So, I am posting this late, but that's okay. This week in therapy we made beautiful MLK crafts to celebrate Martin Luther King, Jr.'s birthday on Monday. Here's peek at my Lesson Plans and the craft set up. You can find the craft in my TeacherspayTeachers store. It's called: Martin Luther Speech Therapy Crafts. My kids really enjoyed it! I hang my samples on the board. I also love to have a visual for my students see. Here are some of my student creations. Are they cute! They have the speech words hidden under the hair curl or on a feather. We practice our words as we glue the words on. They take the crafts home for extra reinforcement. The product includes all sounds in all positions plus blends and a blank sheet that you can use if the student is working on language or fluency goals. The second therapy session of the week we used my Martin Luther King, Jr. Speech Therapy Social Game. We discussed all the characteristics of a good friend by using my chart that is included in the unit. Then we played the fun game and decided if the friend on each card was a good friend or a bad friend. I noticed that it help my students with processing. They had to think about what was read to them. I let my readers read the card and we listened for words that contained their sound. I drilled their speech sounds before they were given a card. They really enjoyed the game and I hope that they will think about how they treat their friends. This unit has an included homework sheet for articulation or language. It also includes the lesson plans that you see in the first picture above. Thanks for taking a look at my week in therapy! I hope you had an awesome week! How do I "try" to stay organized? First and foremost, I can NOT live without my speech data binder. It stores all of my students and billing forms. They are organized by group. I'll even tell you how I organize my schedule to make using my binder super easy. It really helps me! I have the step by step to creating a binder in my TpT store if you need some help. I keep all of my student data and attendance on my super easy Articulation Progress Data Forms. The forms have all the sounds that I need in all positions. I have them at the word level, phrase level, and sentence level. I just choose the form that I need and place it in my binder. Bam. Data taken. I love these forms, can you tell? They also have a graph to show progress or regression. Here's a FREE SAMPLE! Try it and let me know what you think. The second way that I stay organized are my binders. I take my products and place them in a binder in a way that I can easily find what I need. Here's my Speech Language Screening Binder as an example. I always clearly mark what's on the inside. Then, I buy separators with pockets and label them accordingly. This binder marks all the grade levels in my screening protocol. I use this about once a week. When the student comes in I can quickly grab the form I need. I place all of the screening visuals in the front of the binder. I put each sheet into a page protector. My screening forms tell me which visual I need at the bottom. It makes screening so smooth for me! My third and final way that I stay organized is not a binder or a form. It's my favorite cousin Rachelle. Our school nurse had to leave in the middle of this year and Rachelle has stepped in to help all our little ones. She's the smartest nurse I know. I tell her that I really should have paid for half of her nursing classes because I use her wisdom daily. She makes me laugh EVERYDAY. I just love her. We have known each other forever. Really. She is a hyper focused, super organized woman. She won't leave work until every single child has been documented. She has been my inspiration to bill each and every day so that I don't let things pile up and get overwhelmed. Can you tell we are related? This picture just makes me happy. 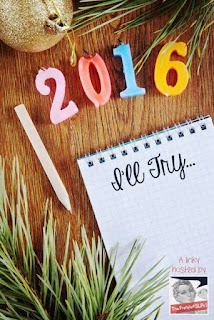 I'm excited be a part of the Frenzied SLPs January Linky Party! Thanks so much to all who host this! So, it's a new year. Time for changes and resolutions. The Frenzied SLPs would like to know what I will do this year to make my life easier. I am a very new blogger. As in only a few weeks newbie. I hope to start posting at least once a week about what I will be doing in therapy the next week. If I do that, then I will have to write my lesson plans a week in advance. That will be a huge deal for me. I am the "wait until after church Sunday night" kinda lesson planner. I have heard of SLPs who have their whole month planned out ahead of time. What a dream. The thing is, I feel trapped by a planning my lessons ahead of time. I have done it before and I will always find something else that I would like to do. All it takes is a cute craft or something that I know my students will love and the plans go out the door. But isn't that part of being a therapist? Constantly changing and adapting? So, I think I will "try" to plan a week ahead this year. You should be able to hold me accountable by checking to see if my blog post plans match up with my Instagram shots. I give it my best shot. Let's see, I'm writing this post on a Saturday...so let me go and get started on those plans! I hope you have an awesome New Year!